On the 10th of September Vincent Scheerman and Anoeska Wouterse celebrated the most important day of their life. 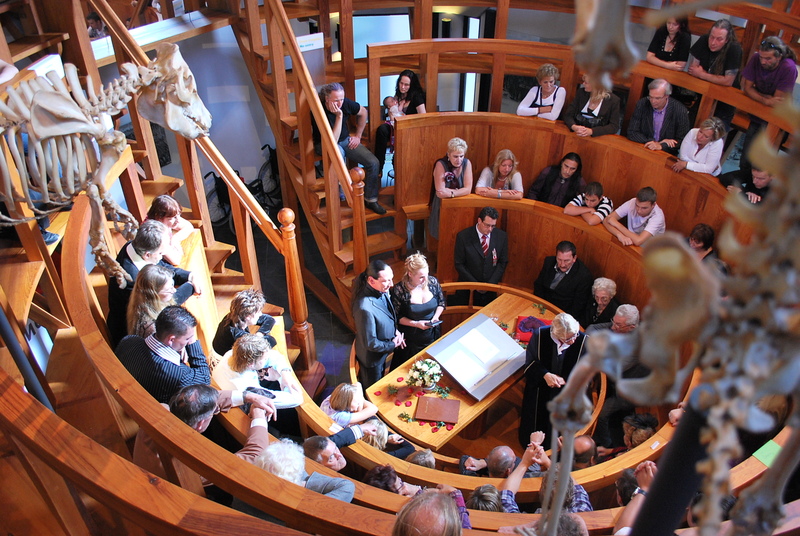 That memorable day the couple got married in the anatomical theatre of Museum Boerhaave. And what better place to choose for celebrating their love for each other then in this unique theatre of life and death. Vincant and Anoeska had a long standing wish to get married here. The both share a common interest in scientific discoveries and nature. Besides Vincent has a special connection with the anatomical theatre, he’s working in the conservation department for more then 20 years now. The Museum was honoured to act as a wedding location for the first time in it’s history. In the evening the wedding guests were treated to a special guest. The Leyden butcher Ed Noseman showed his craftsmanship. He dissected a two years old pig and explained were our meat comes from. It was almost like the old days were back again. In 1593 the University of Leiden was one of the first to build an anatomy theatre in Europe. It was constructed in a former church, which had fallen to the city of Leiden after the Reformation. In the winter the professor of anatomy conducted public dissections of corpses. During the summer months there was no teaching and the theatre was turned into a kind of museum containing human and animal skeletons. There were also curiosities such as Egyptian mummies and Roman antiquities. It was a place where visitors could stand in amazement and ponder the transience of life. In the 19th century the anatomy theatre closed down, leaving no trace. What you see here is an actual-size reconstruction of how it must have looked in about 1610, based on manuscripts and prints. The skeletons are also modern, but a few of the curiosities have survived. 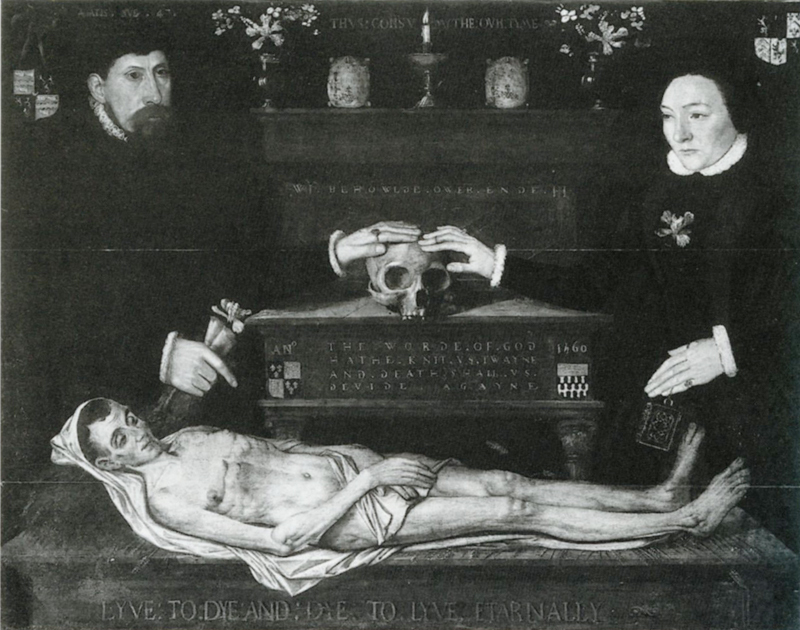 "The Judd Marriage Portrait" from 1560, to be found in the book Death in England: An Illustrated History (click here to find out more). 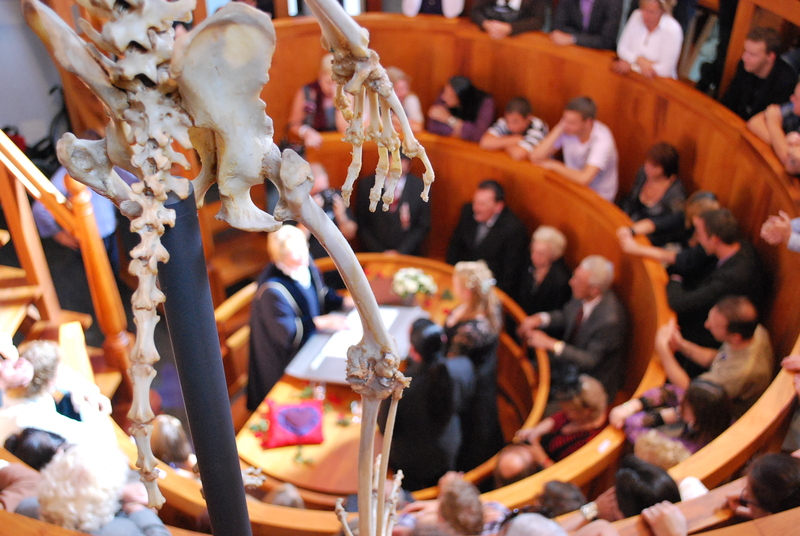 All share a concern with the ritual contemplation of mortality meaningfully combined with a celebration of the beginning of a new life; I like this combination very much, and find it quite in keeping with the tone of the Museum Boerhaave anatomical theatre. Congratulations, Vincent Scheerman and Anoeska Wouterse, on the beginning of your new life together, so beautifully heralded in at the Museum Boerhaave anatomical theatre! Thanks so much, Bart, for this report and the photos. Click on images to see larger versions; well worth it on all counts. You can visit the Museum Boerhaave website by clicking here; you can see photos of the Museum Boerhaave collection, and of its epic skeleton-decorated anatomical theatre, by clicking here. you always have the most fastinating things on your site. Delightful. Congratulations from the two of us here in California.